At age 9y old, Cooper Gokee was the 2013 Honorary Race Starter for the Run to Fight Children's Cancer. Diagnosed with Acute Lymphoblastic Leukemia in March of 2012, Cooper struggled to find his new norm. Now 13 years of age, he is well on his way as he enjoys everything active! 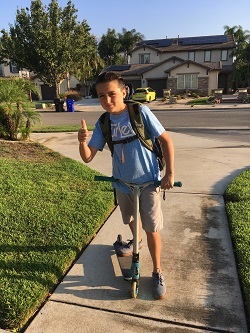 This 8th grader is interested in soccer, skateboarding and of course, hanging out with friends. Read all about Cooper here.